This is a cocktail party I did in March of 2009. The first I had at my house in Venice Beach and by far one of the most memorable nights I have ever had. I had 65 people attending and it was a huge success with the most crazy road to get there. I am by far one of the most organized people there are when it comes to my work, which is why I can pull of the toughest of parties almost single-handed. The morning of the party I woke at 6 am to start making massive amounts of cream puffs. Now, it had been a while since I had made pate a choux, the French pastry dough that cream puffs are made from and it didn’t start off well. I was doing a chocolate cream puff for the first time and for some reason my first 2 batches of dough were runny and didn’t puff. I start to get flustered and realize I need to go buy more eggs. In a rush I go running to my front door and trip over a cord. I go flying head first into the door and knock myself a little cuckoo…and out of my shoes. I sit stunned for a few minutes and finally make it to the store. Cream puffs are done. My headache starting to subside a bit. I look through my prep list and decided I am going to do start the fritters. In my so called organization, I have forgotten to buy the milk and enough eggs for the fritters. Back to the car, being careful not to trip on cord again. I am starting to just panic a little bit in that sort of “if this is what my day is like, how is my evening going to go”? Can I pull it off? I get that out of my head and just focus on the task at hand. Jump ahead 3 hours. It is now 4 in the afternoon and I am at a cleanup point. Everything is organized and ready to go. Kitchen counters are clean and cleared of all clutter. It is now time for a good sweeping and mopping before I take a load off and sass myself up for the evening. As I am standing in the middle of my kitchen, not touching a thing, I hear a loud popping sound at the same time all my electronics in the house make crazy static like noises. A split second later I feel what seemed like a bolt of super charged energy go shooting straight through my chest. It knocks me to my knees and knocks the breath out of me. I know I have just been electrocuted, but have zero idea how. Every muscle in my body starts to tense up and within a minute I hear sirens. I am thinking to myself in all the confusion “how did they know?” It was at this moment the power went out. I walk outside my gated yard and into the street. I live on a fairly busy corner in residential Venice and it was filled with people, fire engines, police, and stopped cars. I am obviously standing there with a “WTF” look on my face and everyone that sees me starts pointing behind me. I go outside to check with the power company and also to ask them why I got electrocuted standing in the middle of my kitchen while not touching a thing. What had happened is that the house had caught on fire and burned down the power lines from the transformer. They fell and hit a chain link fence and sent a giant surge of power through the area…that just decided it was going to ground on me. Twenty minutes later the power comes back on. I get dolled up in my best apron and high heels and throw what was one of my best parties ever. The evening could not have gone any better and I couldn’t have been happier…or sorer. It took a lot of muscle relaxants to get me through the next few days, but the head injury, the electrocution, the annoying trips to the store were all worth it to see the smiles on my guests faces. This dinner was most aptly...and mistakingly named this. Confusion is exactly what it was. Food allergies left and right and we could not keep them straight. Wheat, soy, dairy, vegan. Oh gourd, was my brain as fried by the end of this meal as the gyozas I served. The food was great and people seemed to be very happy...nobody died as a result of the confusion and fun was had by all...except me. I went home at 4 in the morning with what was left of the wine and an entire caramelized banana cake with all intention of spending my Sunday getting drunk and eating that entire cake in front of the TV. I placed the cake nicely on the counter and proceeded to take my good friends to the airport. Oh, the excitement was building on that drive home...cake, wine, movies, cake, cake, wine, and sleep. As I walked in my door, Gypsy, my friends dog looked at me with THAT look. The tail between the legs one. From the front door I saw the broken plate on the kitchen floor. I felt like "the old man" from "A Christmas Story" when the Bumpass hounds ate the Christmas turkey. There was nothing left except the shattered plate and a dream. She even ate the plastic!! Ahhh, the icing on that cake you ask? The shittiest kind of all. I had to spend the next three days walking said dog and picking up my "cupcakes." I want a do-over with this dinner!! 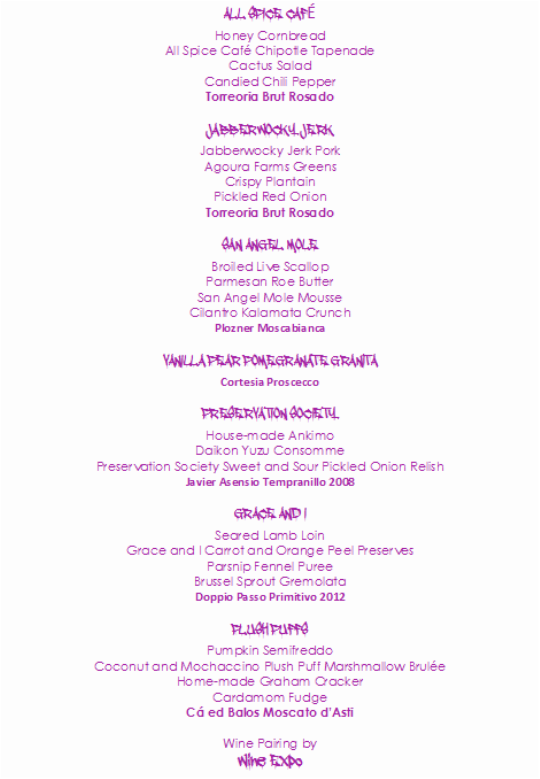 This was by far one of my favorite menus I have ever done. No food allergies, dieters or restrictions allowed! I even fried the oysters in the bacon fat. I spent most of the evening fighting off the guests coming into the kitchen to hug and kiss me after their first bite of each course. I would love to repeat this one in Los Angeles, but I am afraid they just couldn't handle the decadence...and when I say decadence, I really mean fat!